Our Training Department consistently strives to develop the right training solution for your needs. We offer a range of product training solutions to ensure that you are proficient in the use of your accounting, ERP, and or Payroll software. Whether you are a professional and already experienced Software user or just a beginner, our training solutions will assist you to contribute to your company’s overall success. All courses are designed to give hands on, practical training in a classroom environment. Multisoft Solutions offers high quality training programs targeted particularly at Finance, Supply Chain & Logistics, Payroll and HR professionals. Our training department consistently strives to develop the right training solution for your needs. All courses are designed to give hands on and practical training. 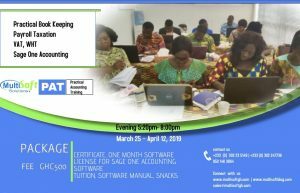 Send an email to training@multisoftgh.com and you will be contacted to complete the registration process.